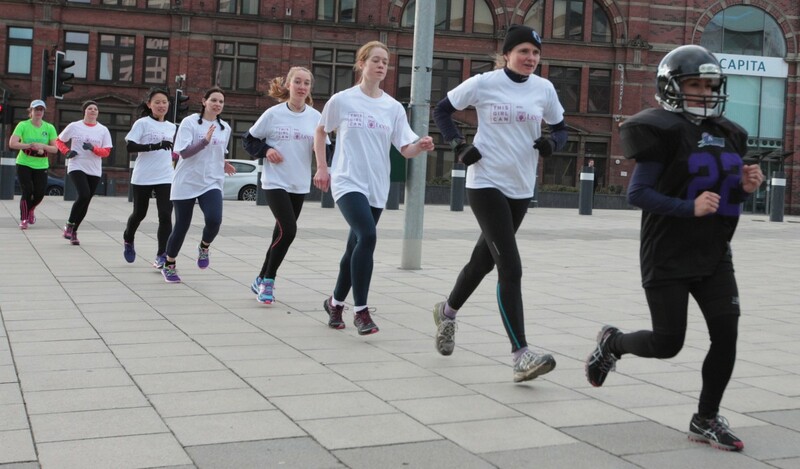 I have to admit, I got a little teary during the second of our guided 5K runs for International Women’s Day yesterday. Supporting the launch of the This Girl Can campaign with RunLeeds, we were running with our all-abilities group along the canal in a sudden burst of glorious sunshine. The more experienced runners had broken off in front a little, but noticing that there were runners in the back, they looped back and joined the very rear of the group. As they each shouted encouragement and motivation to the newer runners taking their turn at the front, I felt blessed to be a part of such a supportive, inspiring group and welled up a little. 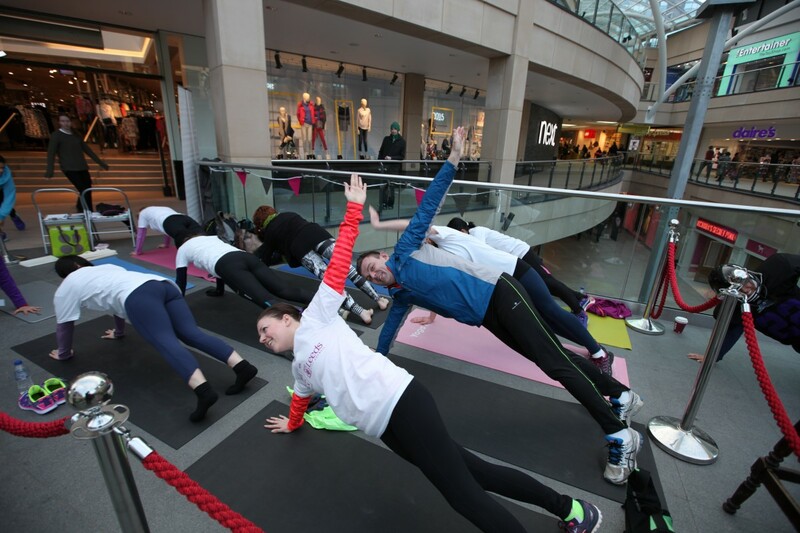 The day was fantastic to be a part of – the whole of Trinity in Leeds was taken over to showcase the best of what Leeds has to offer in sport. From table tennis, to Olympic divers, to street dance, to the university rugby team, there was something to interest anyone. 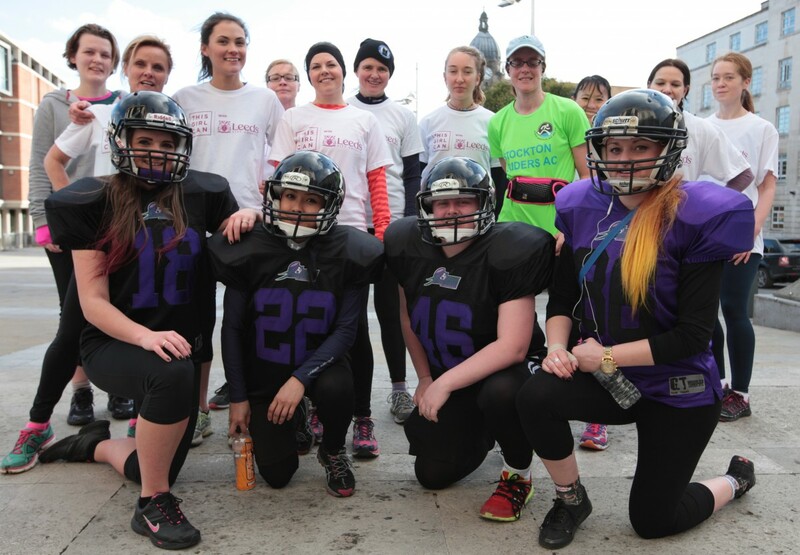 Some members of Leeds Beckett – Carnegie American Football Women’s Team team proved themselves to be incredibly game by even joining us a our run in their full kit, and not complaining at all, even when their shoulder-pads meant they clipped the odd lampost. Total stoics… they only told me how heavy the kit was when I specifically asked them! 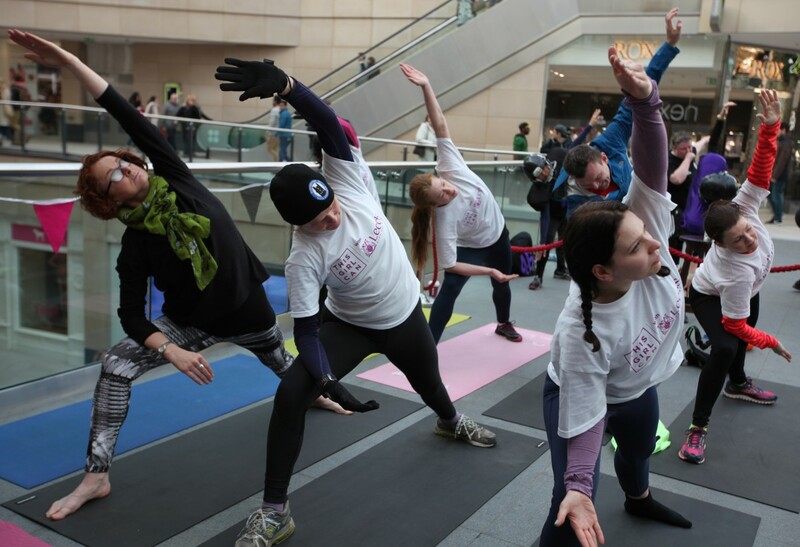 We came back to Trinity to finish off with Roga sessions with Liz from Downdog Days with support from Yoga Kula. A runner herself, she knows the right asanas for tight hamstrings and sore calves, and isn’t afraid to throw in some strength training to help prevent future injury. Over the course of the day, dozens of runners and hundreds of spectators got a chance to get involved in exercise, and see how much fun it can be. Oh man, it would be so great if some of the people involved or observing, even a little fraction, were inspired to see that sport is for anyone and enriches your whole life. Especially important as we enter Spring, and the magazines start to spout their nonsense about bikini bodies. The passion apparent in all the women showcasing their sports was so much more powerful than that insidious poison. I loved the idea of the This Girl Can campaign as soon as I heard about it, and I have to say it’s actually exceeded my expectations. Not only are they changing the discourse about women and exercise from a body-hating to a body-positive message. But they’re actually doing something practical about it, too. Making the sport and exercise already available in our communities visible to people who might otherwise be out of the loop will help increase participation and letting us all know what we can access, and loads of it for free. – Leeds people, check out our run clubs. – If you’re not from round here, use this link to find a running club near you. What inspires you to get more active? What are your favourite ways to exercise for free/cheap? Thank you ladies for a lovely afternoon! We really enjoyed the run and the roga – made a nice change for us to do something different!